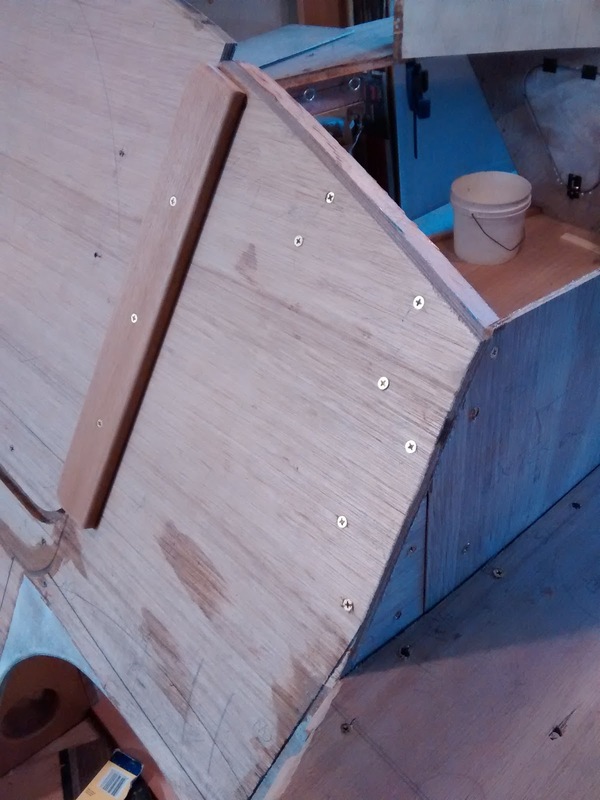 Choosing not to follow the Weekender plans and construction videos exactly results in consequences that require figuring things out some other way. 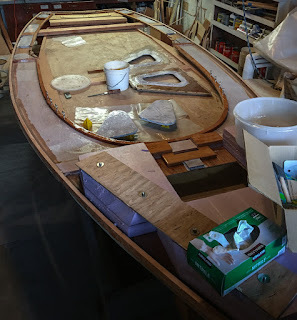 I have used the Back Yard Yacht Builders and Messing About forums for many solutions. 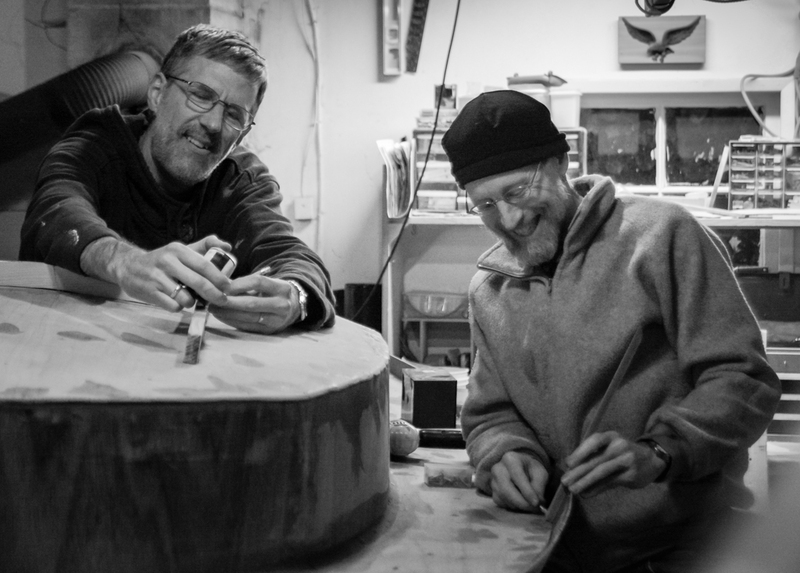 Touring Barry Pyeatt's Spirit Wind while he was alive helped a bunch, too. Which is where I learned about Racelite products. The plans show how to install the chain plates after the rub rails have been attached. I preferred to mount them first. In so doing, I discovered a few things I had to deal with. 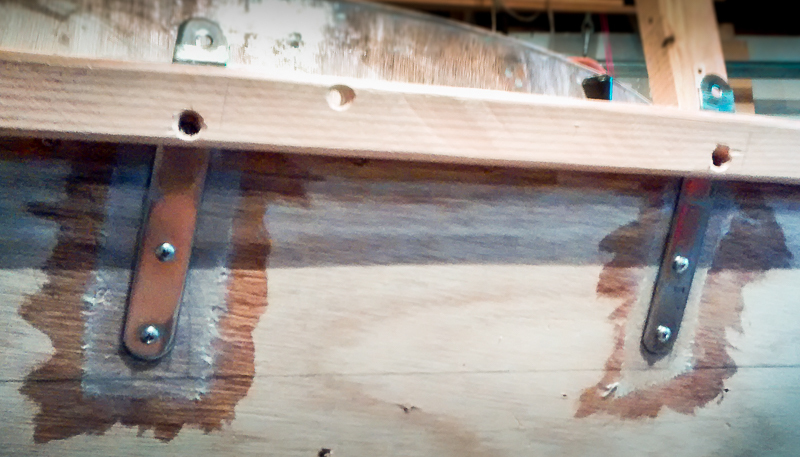 No toe rail on the deck makes for dangerous footing. 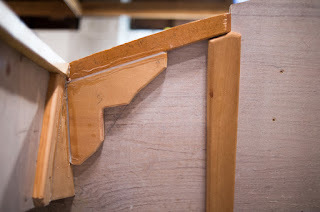 The plans call for a toe rail. 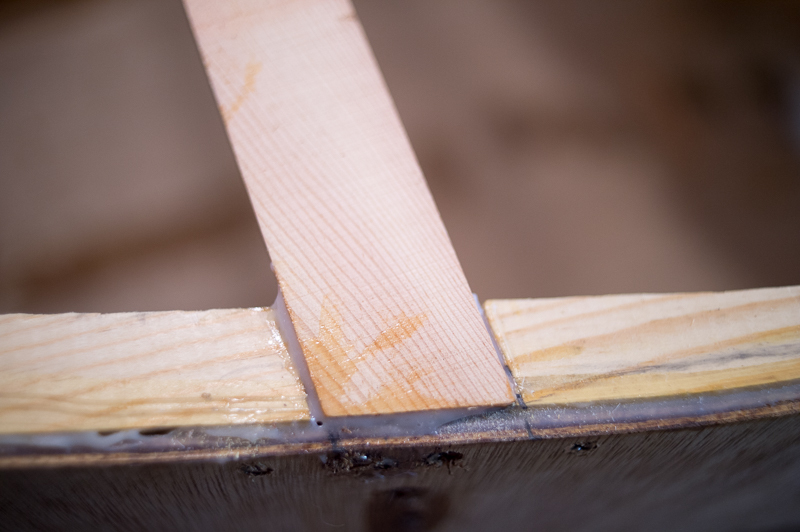 The toe rail in the plans traps water on the deck. 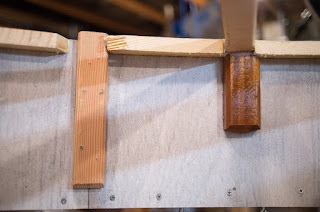 I chose to drill scuppers because it is the most expedient option I could find. Here is a Weekender without a toe rail. 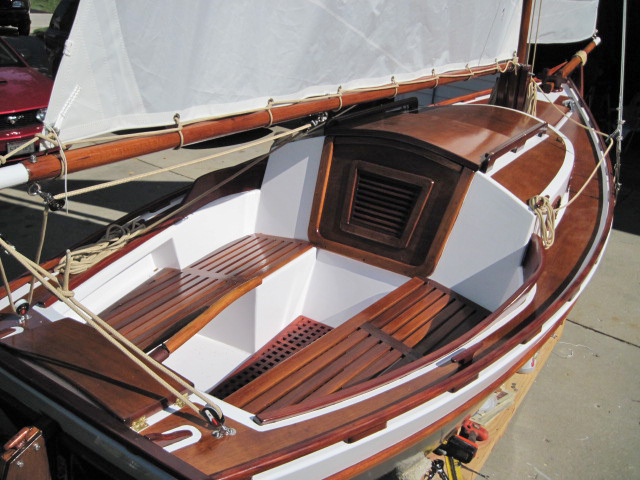 If I were constructing Kingsfold as a boat building "show piece," I might have done a toe rail like the one on this boat. And in parallel to the construction work, we continue to keep our eyes on the goal—successfully completing the full Race to Alaska in as short a time as we possibly can. Safely sailing an under-20-foot boat to Ketchikan is a big deal. 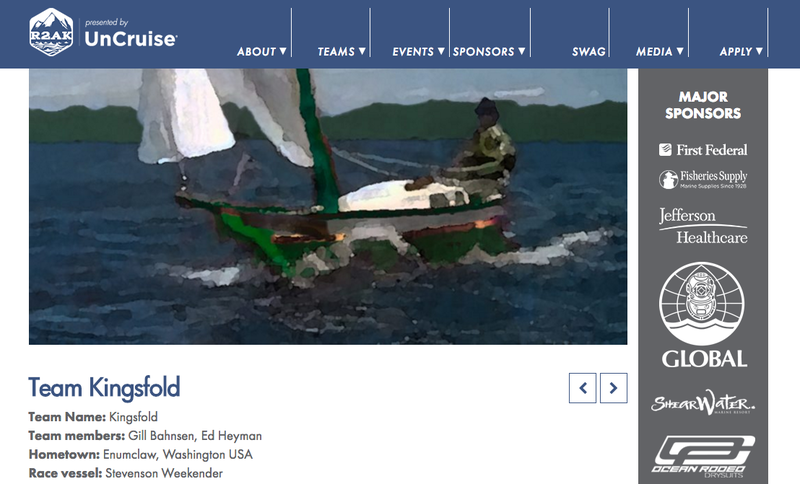 Ed and I are realizing how much more we need to do beyond getting Kingsfold in the water. We need to be comfortable in conditions like these in Johnston Strait and Dixon Entrance. To develop the necessary skills we will need to put more time into training. 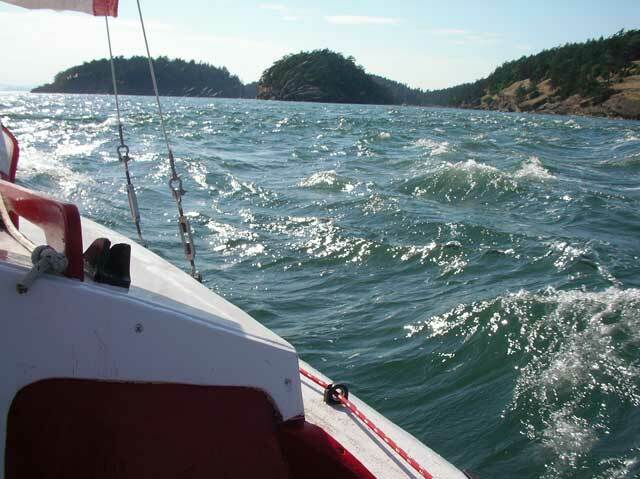 That means we will only go for Stage 1—Port Townsend to Victoria—in the 2018 R2AK. But come 2019, get ready to track Team Kingsfold all the way. 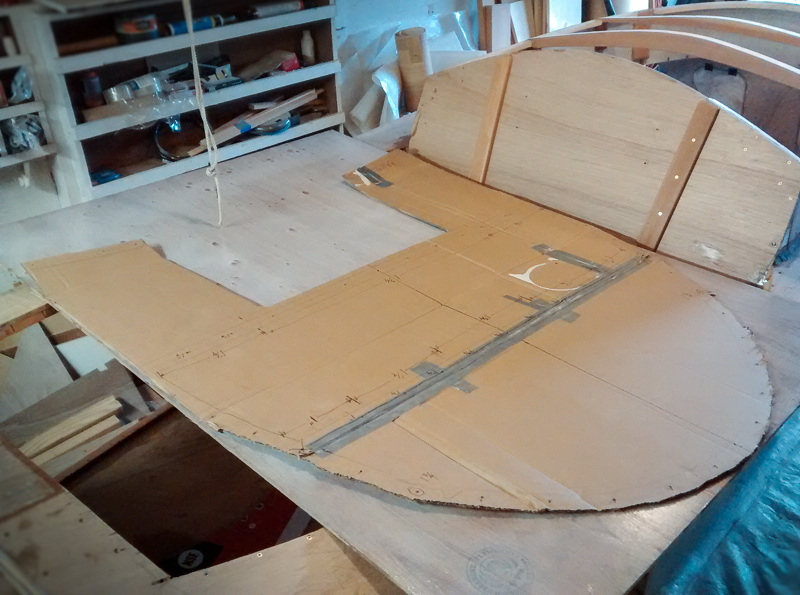 Thanks to Ed's help, we now have all hull panels and rub rails dry-fit, waiting to be attached permanently! 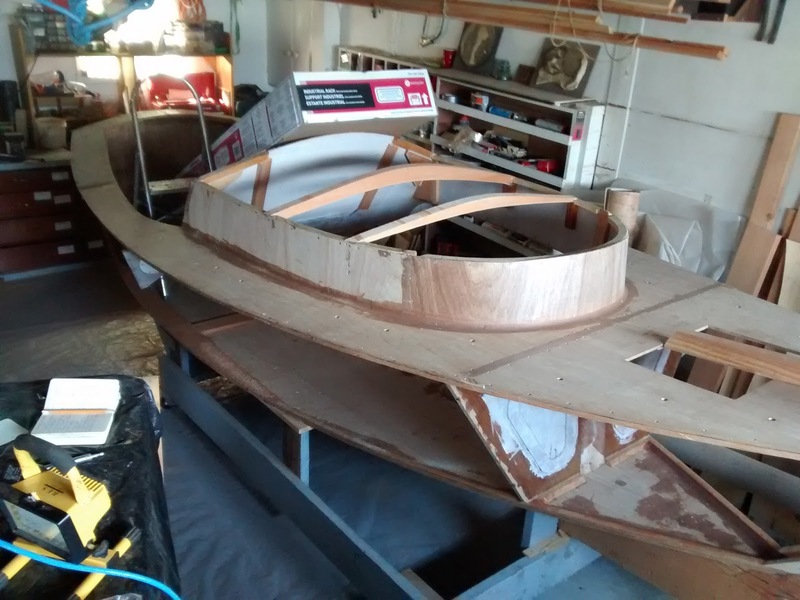 She looks a mess at this point in the build process. But it comes with the territory; the mess is a good one. 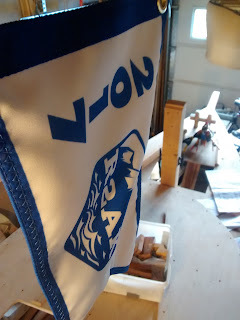 While I may be the prime "mover and shaker" on this project, and the one who's put in the most hours, I've not done it alone. 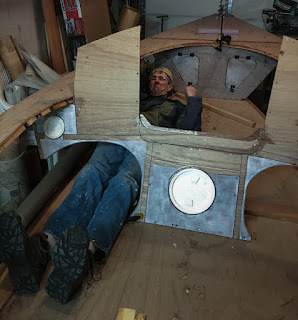 Having Ed's help last week got us much closer to permanently attaching the hull sides. That will mark a major milestone, providing a lot of hope that this boat will be getting wet soon. 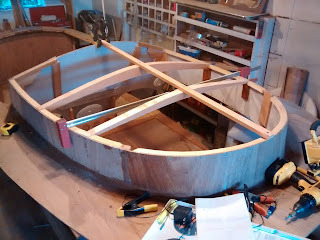 The work I have done recently runs down the center of the boat. 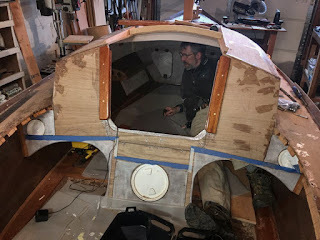 From fore to aft: the bits were permanently installed, the main hatch rooftop structure is dry fit, the companionway boards and trim are completed, a structure for the upper gudgeon to hold the rudder at the correct angle was installed. 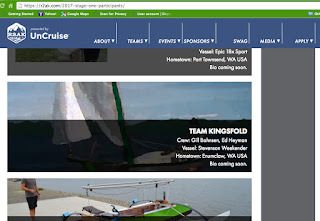 These photos show how close Kingsfold could come to this year's Race to Alaska. So it's keep plugging away at construction. 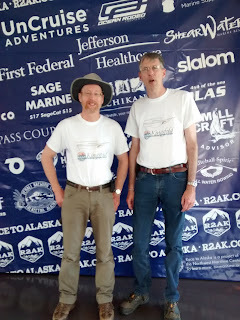 Add to the knowledge we gained talking to other R2AK Teams in Port Townsend. Do the best we can to be prepared for the challenges that can arise sailing to Alaska (and even in just the first stage of the Race to Victoria, BC). 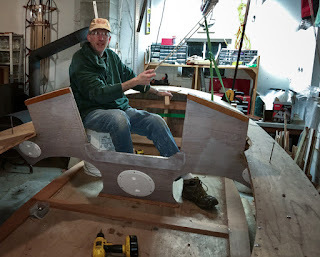 Their sliding seat for rowing will make our chosen form of auxiliary propulsion (since motors aren't allowed) much more productive. I researched pedal drive options because I like that concept. And a number of boats in the R2AK have made good use of pedal propulsion. But those units involve a lot more work and money to install. And they may not necessarily move my boat any better than a pair of good old-fashioned oars (with a nifty sliding seat—Thanks again, Gig Harbor Boat Works). Showing the starboard side with hull pieces dry-fit in place. 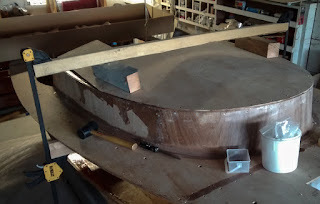 My Most-Favorite Roofing Job Ever! In a younger life of mine, I worked as a roofer, installing torch down, cedar shakes, asphalt shingles, the basics on a variety of commercial and residential buildings. Now I can add wooden boat to the list, my boat. I did use a two-step ladder, not a 40 footer. And I didn't have to worry about the weather. 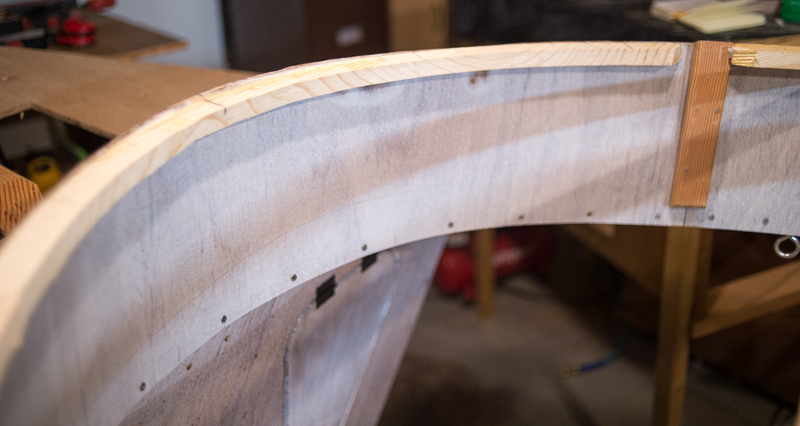 It was also my first curved surface roof. 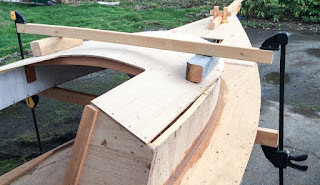 To install the roof this way, the hull sides must not already be attached. Also contrary to the plans and videos, I made a cardboard template by taking a 4' wide piece and stapling it down, centered, to the rafters and stringers. 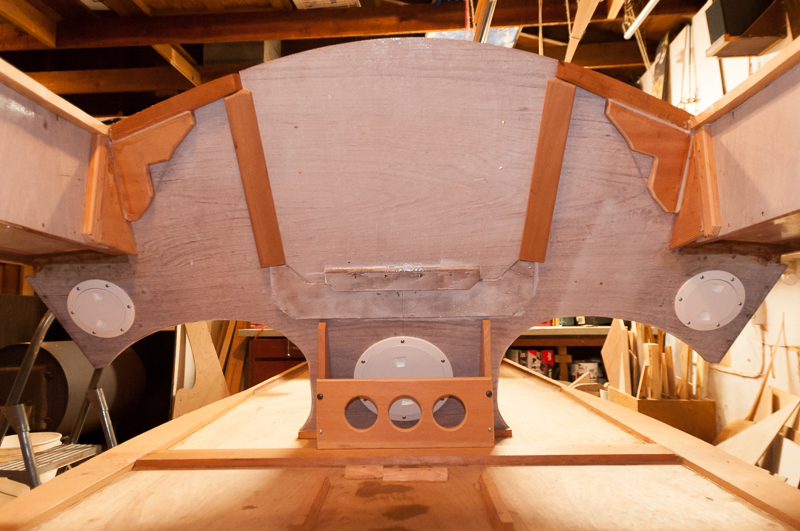 I trimmed the outside edges to the cabin, and traced the rafters and stringers onto the underside. 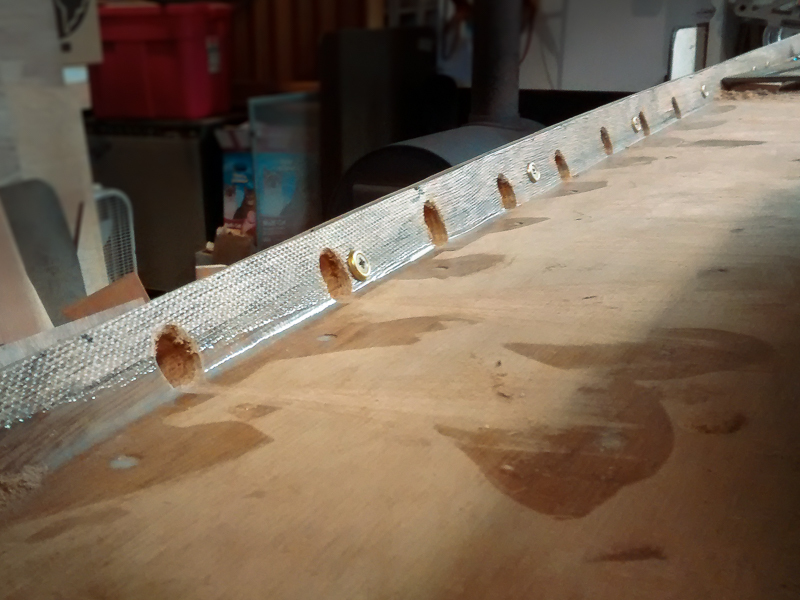 After unstapling, I marked on the template where (and what length) screws would go. 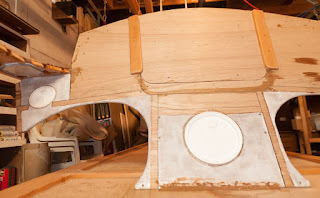 And cut out the area for the hatch opening. I then placed the template on my 9mm plywood and traced the silhouette and transferred the screw locations. I drilled pilot holes for the center-line screw locations on the rafters and stringer at the front of the cabin. 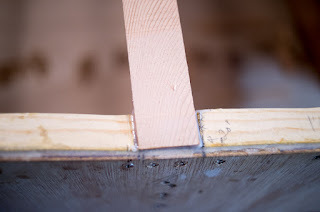 Aligning the plywood onto the rafters, I temporarily put in those three screws. I clamped the material as shown and drilled and screwed the remaining screws into place. Then I traced the rafters and stringers onto the underside of the roof piece so I would know where to apply epoxy on that surface. While the clamps were still tight, I removed all the screws, clamps and plywood piece so I could prepare the joining surfaces for epoxying. At which point, I epoxied both the rafters/stringers and marked areas on the cabin ceiling surface. 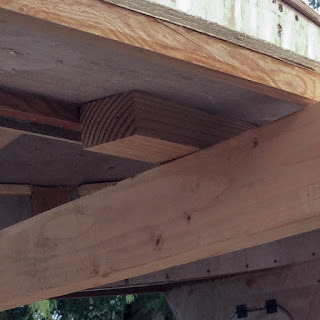 I used finish nails through the three (or more) central screw holes to initially align the roof in place on the rafters. 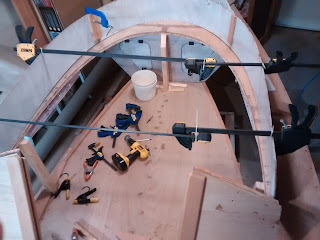 As with the dry-fitting stage, I installed the three central screws, installed the clamps, and then the remaining screws, beginning with the aft rafter alternating side-to-side, the fore rafter, the stringers from the aft rafter area forward to the middle on both sides, then finally the aft edges to the top of the cabin bulkhead. 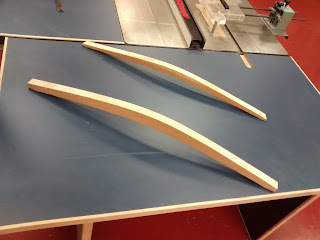 I discovered during the dry-fitting stage that the "two by" pieces need to be the same length. 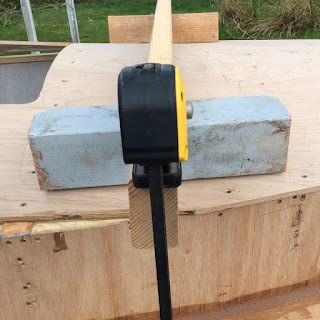 It is very important to include a small block (positioned as shown!) 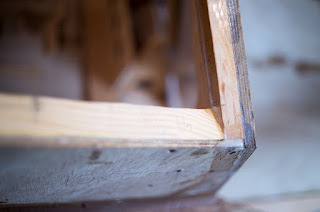 to protect the deck stringers, and deck, from damage. 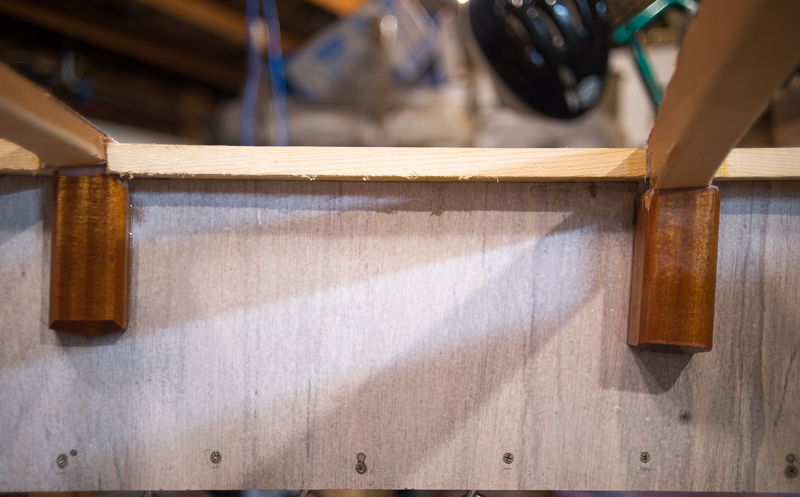 Make sure to size and position the 4"x4" blocks between the rafters, long enough that you can still drive in the screws. 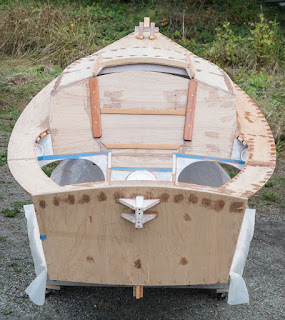 I have spent a lot of time planning, tweaking, designing and building my boat in my head—long before I pick up any wood. In this example, I happened to have recently read a Chapman Piloting and Seamanship chapter on compass use. 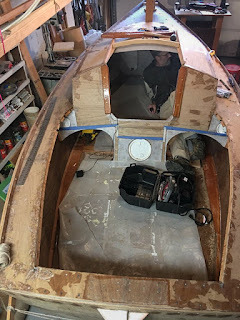 So I used brass fasteners (to minimize magnetic interference that might occur with the stainless steel fasteners I use in the rest of the boat) in the area where I plan to put a bulkhead-mounted compass. Since I am building Kingsfold pretty-much all alone, and using epoxy, it is imperative that I dry-fit (install in place with screws but NO adhesives) all assemblies prior to gluing. 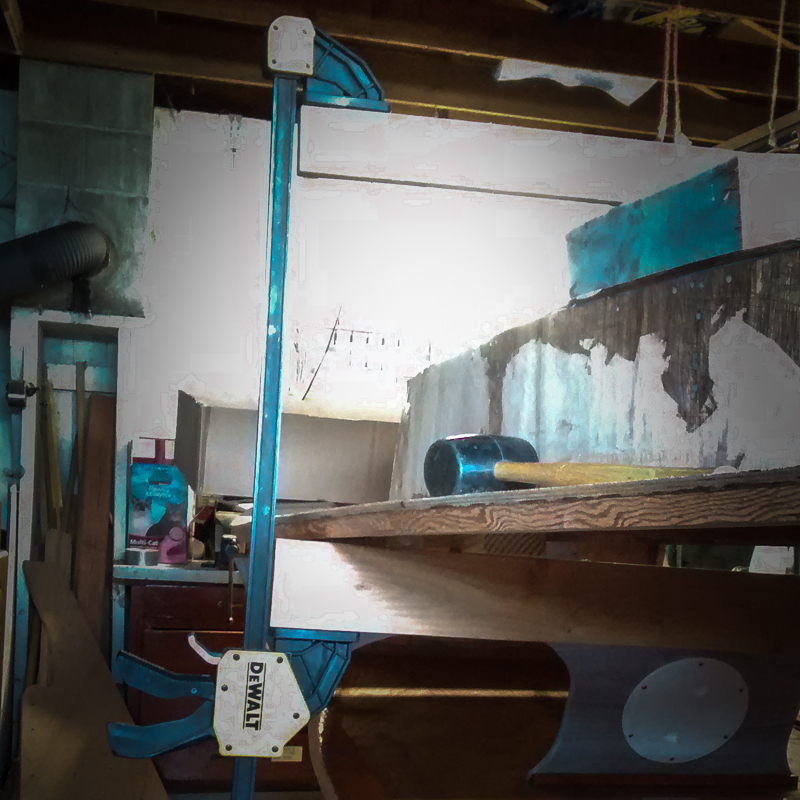 I use clamps a lot to keep parts in their proper positions. Then when I am ready, I use finish nails, strategically placed in screw holes, to keep the parts aligned once I've coated the surfaces with epoxy and am ready to begin screwing the sections together. In the case of the cabin trunk, I added cable ties to extend the length of the clamps and temporarily sew them to the plywood. 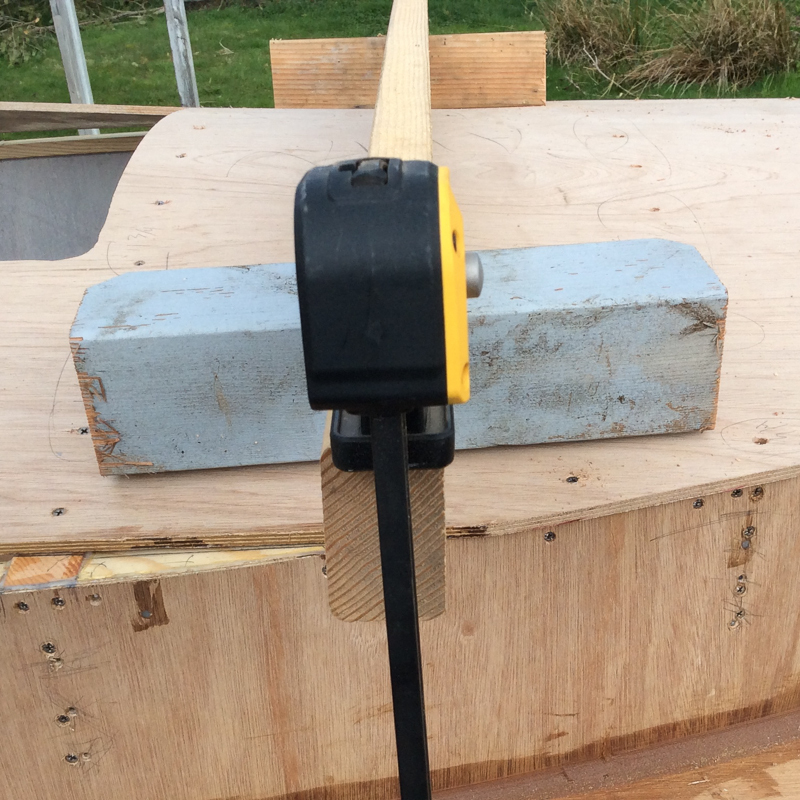 This made it possible to lift the entire bent plywood assembly and position it in place in the deck. 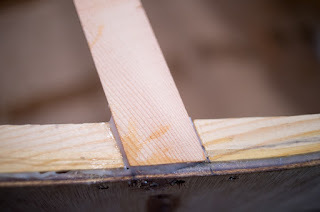 I also used five sticks to align the bottom edge of the trunk with the bottom edge of the deck stringer. 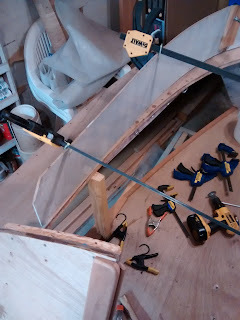 After gluing the roof stringers to the upper edge of the trunk and allowing the epoxy to cure awhile, I cut notches and dry-fit the rafter chocks for the rafters. I marked the curves and my daughter cut them out on the bandsaw in the wood shop of her school. This is how a built the aft corners. I am not recommending you follow my example, but I am content with what I did. 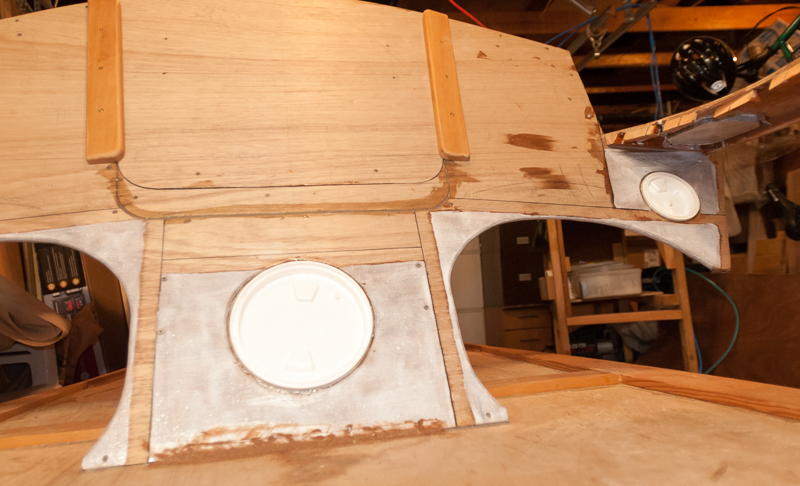 And the epoxied cabin trunk, ready to have the roof attached. Thursday and Friday, and again today, my R2AK teammate came down to my place and provided huge, very timely help. We finished up some epoxy coating which looked (in part) like this late Friday afternoon. 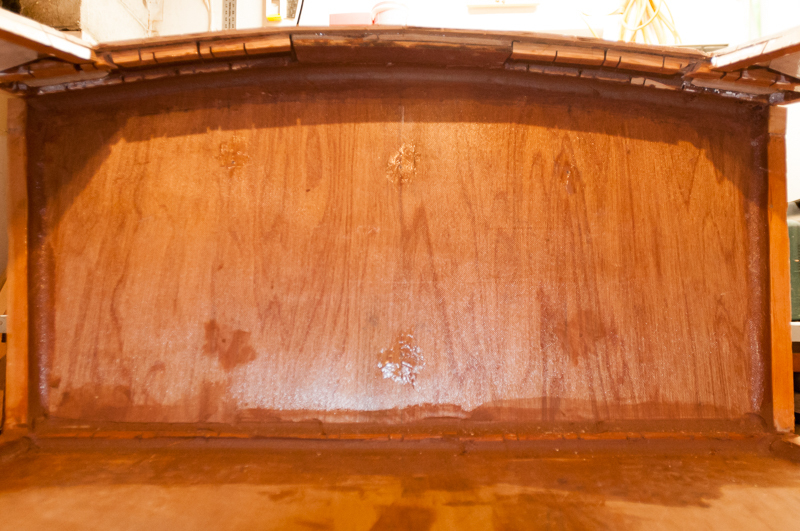 The forward section of flotation is visible. More will be added under the deck on either side of the cabin. Today Kingsfold is permanently 3-D! I stuck my spindly legs into the port berth. I still fit moving farther aft. 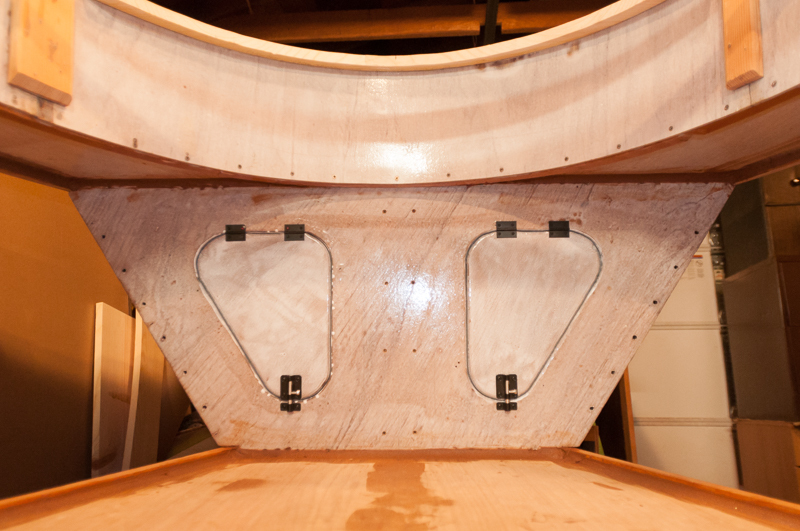 The whitish areas on the cabin bulkhead will be hidden by the seats and cockpit floor. And posing for my R2AK partner's camera.